In the season of Lent, we enter into the 40-day fast that Jesus undertook in the wilderness. Through this dedicated period of prayer and self-examination we invite, we open ourselves to God - to allow him to further shape us into the image of Christ. Moving ever closer toward Holy Week and the event of the crucifixion, we surrender our hearts to God to better know Christ's suffering, his surrender and his ultimate sacrifice, for our sake. The season begins with Ash Wednesday, when we receive the imposition of ashes and are reminded we are but dust and to dust we shall return. During this season, we observe chosen forms of fasting, prayer, service or charity for 40 days, except Sundays, which are considered feast days, year-round. Figuring out how to keep a holy Lent can be a challenge, but if we move beyond the popular conceptions (and misconceptions), Lent holds the possibility for real change — or to use the church’s word, conversion — in our lives, as well as for rich and lasting spiritual growth. Lent emerged in our history as a season of final preparation for those who would be baptized at the Great Vigil of Easter. The entire Christian community was highly invested in walking alongside those who were about to commit their lives to Christ. In time, the season took on some extra layers of meaning, and many people now associate it with listening for a deeper awareness of our own failings — how we fall short of the ideals God sets before us — and the need for ongoing repentance and amendment of life. In Lent we step back and consider the ways we need to repent, to turn around — to be converted. The word “lent” comes from the Anglo-Saxon word lencton, referring to the springtime of the year when the days grow longer and warmer and brighter. Lent, then, is an opportunity to deepen our spiritual practice and accountability in preparation for the renewal of spirit and life, through Christ our Lord, that is to come. How are we living Christ’s teaching and example in our own lives, in our homes, our churches, our cities, our schools, our places of work? In what ways have we fallen short, grown stagnant or cold-hearted, or failed to love God by embracing each life as a Divine life, whenever and however we encounter it? And finally, once we have taken sober and truthful stock of our current spiritual life, we ask with a clear heart: What growth or signs of renewal in our life, in the world, can we whole-heartedly celebrate with gratitude and joy? These are the kinds of questions we ask ourselves in prayer, in meditation, in quiet reflection during the weeks of Lent. Lenten Series: Welcome to the Episcopal Church. Following the 10 a.m. service in the Chapter Room. See Program info on this page, right. 12:10 p.m. Holy Eucharist in the Chapel. Note; no 12:10pm service on Tuesday, April 16. 6:30 p.m. Evening Prayer in the Church. 7:00 p.m. Supper & Program: Embracing an Adult Faith: In the Parish Hall. 6:30 p.m. Stations of the Cross in the Church. A devotion to the Passion of Christ, recalling a series of events at the end of Jesus' life from his condemnation to his burial. Procession of the Palms, reading of the Passion. Gather outside, at the corner of Bay and Montecito. Gather on the Veterans Green, across the street. 7:00 p.m. The Service of Tenebrae, Extinguishing of the Light in the Church. 7:00 p.m. Maundy Thursday Liturgy in the Church. Commemorate the Last Supper, ritual Washing of Feet, and Stripping of the Altar. Anthems: Tallis, if ye love me; Duruflé, Ubi caritas; Bruckner, Christus factus est; Victoria, Unus ex discipulis meis. With St. Paul's Chancel Choir. 12:00 Noon-3:00 p.m. Good Friday Liturgy in the Church. Nik Nackely, baritone; Evangeline Wolfe, organ. 3:00 p.m. Stations of the Cross in the Church. 8:00 p.m. The Great Vigil of Easter in the Church. With kindling of New Fire, Exultet, the First Mass of Easter, and Baptisms, too! Meet on the front step of the darkened church, for the lighting of the ritual fire. Anthems: Handel, Hallelujah; Byrd, Sing joyfully; Harris, Faire is the Heaven. With St. Paul's Chancel Choir. 8:00 a.m. Holy Eucharist in the Church. 10:00 a.m. Festival Eucharist in the Church. Short Communion Service by Charles Wood. Anthems: Byrd, Sing joyfully; Asola, Surrexit pastor bonus. With St. Paul's Chancel Choir. Easter Egg Hunt and Festive Pot Luck Coffee Hour follow the 10:00 a.m. service. This year for the Sunday and Weekday Eucharist services, we will be using homemade bread. If you would like to participate in this special ministry, please contact Father Wilson, office phone: (510) 834-4314 x 502, email: rector@stpaulsoakland.com. Familiarize yourself with the basics of the Episcopalian Church. This new introduction covers the history, structure, spirituality, worship, and outreach of the Episcopal Church in a straightforward, conversational tone. Each chapter includes study questions, making it an excellent resource for adult parish study and inquirer’s classes. Part of the journey in the Church is learning the stories: where it came from, what it believes, how it worships, how it understands the Bible and God, how it reaches out to the rest of the world. Many of the stories are contained in this book. Some of them may have much in common with your own story, and help you understand why you were drawn here, and how your story might become a part of the larger story. From an Episcopal perspective Christopher L Webber explores our history, worship, beliefs, spiritual life, organization of the church, mission and outreach, and the way we read and understand the Bible. Christopher Weber is an Episcopal priest has served inner-city, sub-urban, and overseas parishes. Author and Bible scholar Marcus Borg invites us to join him in revisiting Christianity's most fundamental questions: Who is God? Who was Jesus? What does salvation mean? What place does Jesus hold in contemporary Christian faith? Marcus Joel Borg (1942–2015) was an American New Testament scholar and theologian. He was among the most widely known and influential voices in progressive Christianity. 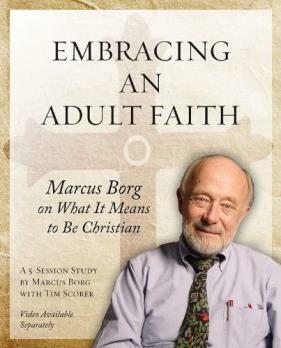 As a fellow of the Jesus Seminar, Borg was a major figure in historical Jesus scholarship. He was Canon Theologian at Trinity Episcopal Cathedral in Portland, Oregon. Internationally known in both academic and church circles as a biblical and Jesus scholar. He retired as Hundere Distinguished Professor of Religion and Culture at Oregon State University in 2007 and died eight years later at the age of 72. In this five-session, faith-formation resource, participants enjoy the rare privilege of witnessing Marcus in dialogue with a small, diverse group of adults as they honestly -- and sometimes painfully -- con-front the big questions and work together toward authentic answers. Meditation is a form of prayer; an act of love, an effortless surrender into receptivity, into openness. Allow everything to simply be. Drop all your resistance to the present moment. Let our journey be a perpetual one. Let us die to the world daily. Let us say with the apostle, “I die every day” (1 Cor 15:31). I am not long for this world. I am passing through, holding on to nothing, grateful for everything. Care and remorse are lost, like motes in light divine. Take a walk in St. Paul's natural garden Labyrinth.